Considered to be a pioneer of the "shred guitar" genre, Michael Angelo Batio is set to release his first-ever career retrospective. 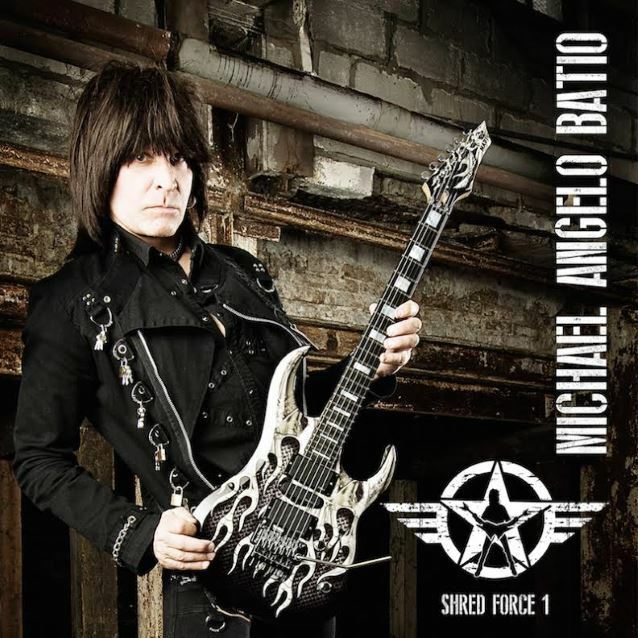 Due on April 14 via Rat Pak Records, "Shred Force 1: The Essential Michael Angelo Batio" not only highlights Michael's best work to date, but also brings together many nationally renowned musicians from the hard rock and heavy metal genres. The album features some of Michael's most memorable performances, including a dynamic version of RUSH's "What You're Doing", which features QUEENSRŸCHE vocalist Todd La Torre, METAL CHURCH guitarist Kurdt Vanderhoof, ALICE COOPER bassist Chuck Garric, METAL CHURCH/TRANS-SIBERIAN ORCHESTRA drummer Jeff Plate and guitarist Craig Blackwell. There is also a cover of DEEP PURPLE's "Burn" with La Torre and ALTER BRIDGE guitarist Mark Tremonti. The album also includes Michael's tributes to Eric Clapton ("Slowhand"), Randy Rhoads ("RRR"; also featuring Rudy Sarzo on bass), and a new version of Michael Angelo Batio's unique tribute ("Diamond") to the late great Darrell "Dimebag" Abbott of PANTERA, that features guitarist Michael Wilton of QUEENSRŸCHE. Also included are some of Michael Angelo Batio's most notable instrumental tracks such as "8 Pillars of Steel" (with guest appearances by Elliott Dean Rubinson, Dave Reffett, Jeff Loomis, Rusty Cooley, George Lynch, Andrea Martongelli and Craig Goldy), "Juggernaut" (featuring ex-MEGADETH guitarist Chris Poland, Dave Reffett, Annie Grunwald, Guthrie Govan, Mike LePond and Michael Romeo). Pre-order bundles are now available at this location. An official audio stream of "What You're Doing" can be found below. "I feel that 'Shred Force 1' is the culmination of my best musical work," exclaims Batio. "These are some of my personal favorite performances along with an army of featured guest stars pulled together by an amazing record company to bring it all into focus!" Michael Angelo Batio showcased his guitar techniques and innovations for the first time with his early instructional programs, as well as in his live performances, which are now considered "standard techniques" amongst guitarists worldwide. Michael not only invented, but was the world's first player of the double-guitar, and was also voted one of the world's "Top 100 Guitarists Of All Time" by Guitar World magazine. He also holds the YouTube record for his instructional video "Speed Kills", which has had the most views for a guitarist, coming in at over 15 million! Michael Angelo Batio has performed over 1,700 shows in 58 different countries since 1993 and continues his relentless touring and clinic schedule in 2015. Michael will bring his shred abilities to television when he makes his debut on VH1 Classic's "That Metal Show" on Saturday, March 21 at 9:00 p.m. ET/PT as the guest guitarist.